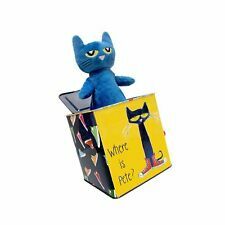 Pete The Cat Jack-in-The-Box, 7"
Clown has a plaster head, hat, collar, hands. 4 1/4" high. Brushed fabric gown. Painted a cream color outside. (British children’s books, comics, newspapers?). CLOWN JACK IN THE BOX. It works good and has nice color but there are a few small scratches and part of the clowns thumb is missing, probably chewed off. Barely used Mattel inc. 1971 jack in the music box. Works great music is perfect colors are great minor nose rubs on clown nose and minor hair line scratches. Great collectors item. Buying as seen in photos. It is by Atico Toys. She has batteries and plays creepy music and has scary voices. Seriously it is creepy! Super Scary Jack in the Box! The Bride of Chucky Burst-A-Box features Scarred Chucky – the infamous homicidal doll containing the soul of a serial killer. Scarred Chucky. Child's Play - Bride of Chucky. Designed after his appearance in the film, Chucky features a scarred head sculpt and sports his signature ‘Good Guys’ overalls with stripped shirt. Trending at C $57.97eBay determines this price through a machine-learned model of the product's sale prices within the last 90 days. Works as it should. The decals on the sides are in overall good condition. 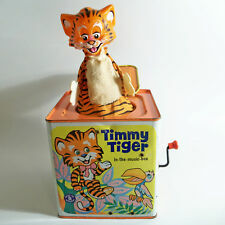 Classic Toy. right away so that we can work it out. Working in very good preowned condition as pictured. See pictures for detail and condition. CAT IN THE HAT MUSIC BOX, POP UP. HE IS IN WORKING ORDER. Vintage Jack in the box toy doll Germany Marolin Papiermache 6"
Manufacturer's Item Number: JJB EAN Since their founding over 30 years ago, they have been dedicated to bringing joy to all who play with their products. They continue to specialize in Classic Toys. 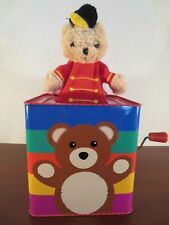 Jack-In-The-Box Boy Clown 5 1/2" Musical Tin Box Pop-Up Toy PA-8097. It is in great shape and works well. 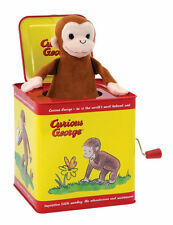 This is a Curious George Jack-In-The-Box. When crank is turned, box plays "Pop Goes the Weasel". Here is a jack in the box that has most of its original box. It is in working condition. Tin Penny 6 Hole Generation Whistle Irish Flute. Fipple Flute is closely associated with Irish and Folk Music. Six Hole Key of D Nickel Plated Folk Flute Features. Schylling Sock Monkey - Jack in Box. Schylling Sock Monkey Jack In The Box.Cute Sock Monkey in the Jack-in-the Box style! 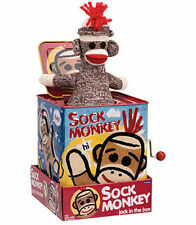 4.5 out of 5 stars - SOCK MONKEY JACK IN THE BOX SCHYLLING TIN TOY- SALE! 30 product ratings30 product ratings - SOCK MONKEY JACK IN THE BOX SCHYLLING TIN TOY- SALE! Made by Fisher Price circa 1970. Push button to open. Another button moves bottom jaw and eyes of puppet-clown. Toy No. 138. Works perfectly. I cleaned every corner inside and out with water and a sponge (no cleaning agents used.). Vintage 1976 MATTEL MOTHER GOOSE Music Jack in the Box~Nursery Rhymes~Works Fine. Condition is Used. Shipped with USPS Parcel Select Ground. 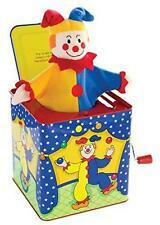 Features a classic Clown plush puppet and Clown art on each side of the tin box. Older 2002 version. Made by Lorraine Novelty Toy Con, designed by Ray Quigley. This is a really need toy and overall very good condition for the age and use. We will do what it takes to make sure you are satisfied with your product and for the service that we provide for you. Bolz CIRCUS CLOWN Metal Jack-In-The-Box Crank Windup Circus Tune Germany Made. Condition is Used. Shipped with USPS Priority Mail. SCHYLLING CLOWN JACK IN THE BOX. Perfect for children as young as 18 months. It's beautifully decorated with attractive and engaging circus graphics that are loved by all children. Vibrant colors. See photos. Assistance League® Inland North County is a nonprofit, all-volunteer organization actively involved and enriching the lives of children and adults in our community through philanthropic programs. It is Jolly Tune clown. It is 5 1/2 " square when closed. The music does not work and the clown does not pop up.The clown's hat is faded and soiled. The inside cardboard is pulled out in spots. I don't know about the plate on the inside lid if it is original to the box. Would look so cute in a child's room. CURIOUS GEORGE JACK IN THE BOX BY SCHYLLING MUSICAL BOX JACK IN A BOX. In very good condition with few dings or scuffs. Tested and working. ALL PICTURES ARE IN FULL-GREAT CONDITION. THERE IS A VERY SLIGHT CREASE ON FRONT PIC AT TOP & A VERY SMALL SCRATCH/CRACK ON TOP CORNER. ALL PARTS OF THE BOX ARE VERY WELL INTACT. WORKS GREAT. In very good working condition. See photos. Box opens by squeezing front panel of box. Condition is Used. This item does contain a scratch on the top of the Jack in the box. Item is in good condition, as shown in the pictures. This is in nice condition and still plays music but the opening lever doesn't always work. I have another job and a family. Most E-Bay people are professional and a pleasure to deal with. 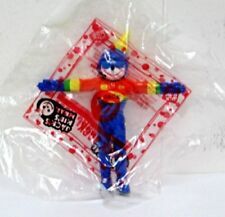 Schylling 1997 Circus Clown Jack In The Box Musical Wind Up Toy. M e t a l b o x, plays Pop Goes the Weasel. VTG~JACK IN THE BOX Toy~©1997 Schylling~All Around the Mulberry Bush....WORKS! ANTIQUE VINTAGE 1958 MICKEY MOUSE " IN THE MUSIC BOX" JACK IN THE BOX TIN TOY. Condition is Used. Shipped with USPS Priority Mail. Music and crank are not working but crank turns freely. Box has scratches and light rust from 60 years of use.